Our school has a dedicated Early Years Reception Class to provide your young child with the finest surroundings for their first school experience. Our commitment at Burton is to create and maintain a safe, happy and child-centred environment in which children are inspired to become purposeful, life-long learners. In the Early Years Foundation Stage our aim is that upon leaving Early Years, our children have a strong sense of self, feel positive about their abilities as a learner, have formed constructive relationships and are confident communicators. Every child deserves the best possible start in life and support to fulfil their potential. We believe that a child’s experience in the early years has a major impact on their future life chances. A secure, safe and happy childhood is important in its’ own right, and it provides the foundation for children to make the most of their abilities and talents as they grow up. When parents choose our early years and our school, they want to know that we will keep their children safe and help them to thrive. This is at the heart of what we do! Setting high standards for the learning, development and care of our children, ensuring that every child makes progress and that no child gets left behind. Providing for equality of opportunity, ensuring that every child is included and not disadvantaged because of ethnicity, culture or religion, home language, family background, learning difficulties or disabilities, gender or ability – this includes children who may be Gifted and Talented in areas of learning. Laying a secure foundation for future learning through learning and development that is planned around the individual needs and interests of the child, and informed by the use of ongoing observational assessment. From the child’s perspective a curriculum such as this should be full of real-life, concrete experiences. Children will often be informally consulted about their learning environments and learning opportunities – we will always endeavour to follow their interests to ensure planned activities and themes are motivating for them. Most importantly, children should feel happy, safe and secure at school and should have ownership of their classroom. The EYFS framework explains how and what children will be learning to support their healthy development and provide the foundation children need to make the most of their abilities and talents as they grow up. The unique child reaches out to relate to others and things through the characteristics of effective learning which move through all the areas of learning, through playing and exploring, active learning and creating and thinking critically. 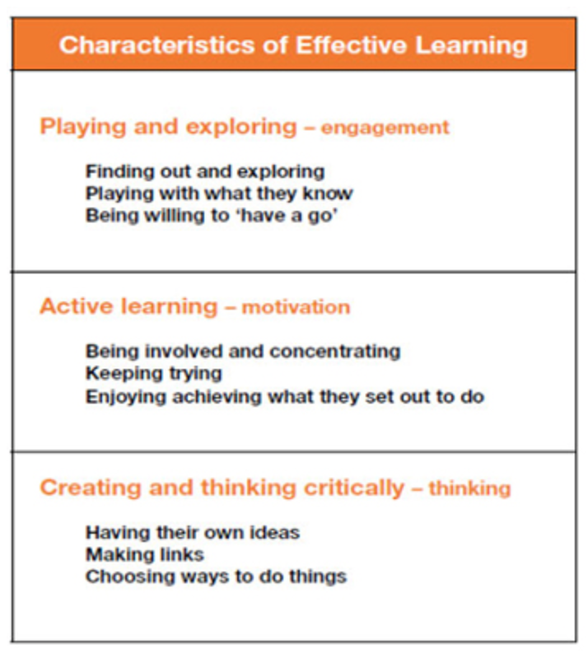 All 7 areas of learning are used to plan children’s learning and activities. The staff teaching and supporting your child at Burton will make sure that the activities are suited to your child’s unique needs. This is a little bit like the curriculum in the rest of the school but it's suitable for very young children, and it's designed to be really flexible so that staff can follow your child's unique needs and interests. This does not mean that all your child's learning is divided up into specific areas. One experience may provide a child with opportunities to develop a number of skills and concepts across several areas of learning. Our expectation is that your child's records will be passed to us from their Nursery or Pre-school setting, enabling us to ensure continuity throughout the Early Years Foundation stage. Phonics teaching and learning are a key part of the Foundation Stage and help to develop early reading and writing skills. The EYFS curriculum is delivered through cross-curricular topics, such as ‘Do You Want to be Friends? , Why do Squirrels Hide their Nuts?, What's that Sound?, Do Cows Drink Milk?, What is a Reflection and Who Lives in a Rockpool?’ If you have already visited our Reception class, you will have seen a range of activities taking place such as role-play, practical games, painting, cutting and sticking and reading in the book corner. You will also have seen the outdoor classroom in operation, with equipment such as bikes, cars, sand and water. Children work and play independently, with a strong emphasis on choice and being able to sustain concentration on projects, as well as joining a variety of teacher-led activities. We strongly encourage a partnership with parents so they are actively involved in their children's learning. Assessment plays an important part in helping parents, carers and staff to recognise children’s progress, understand their needs, and to plan activities and support. Ongoing assessment is an integral part of the learning and development process. It involves staff observing children to understand their level of achievement, interests and learning styles, and to then shape learning experiences for each child reflecting those observations. In their interactions with children, staff will respond to their own day-to-day observations about children’s progress, and observations that parents and carers share. To this end we make systematic observations and assessments of each child's achievements, interests and learning styles. We then use these observations and assessments to identify learning priorities and plan relevant and motivating learning experiences for each child. A good level of development is determined by children achieving the 'expected' level (as above) in the Early Learning Goals in the 3 Prime Areas and the Specific Areas of Mathematics and Literacy. Our Year 1 teacher will have access to the profile report and hold meetings with the EYFS staff on each child’s skills and abilities in relation to the three key characteristics of effective learning. These will inform transition meetings between Reception and Year 1 teachers about each child’s stage of development and learning needs and assist with the planning of activities at the start of Year 1.